Want to inspire creativity and develop your students spatial awareness and design skills? 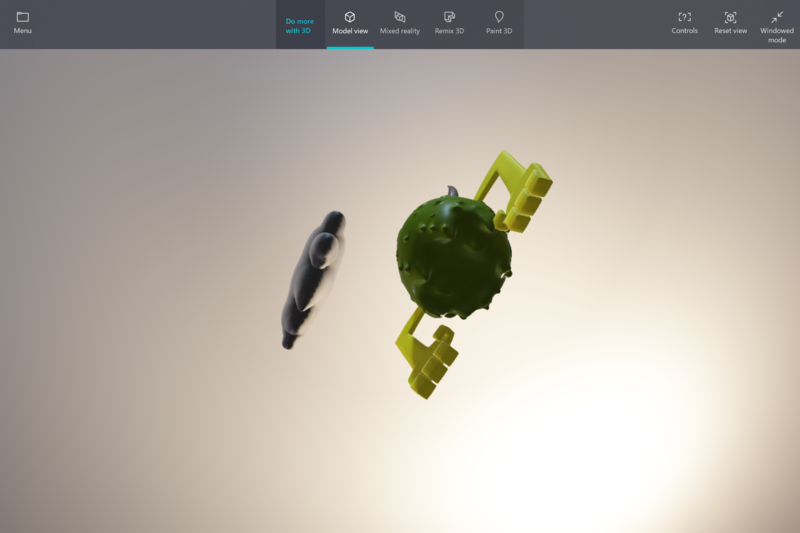 This post will show you how to create 3D models and bring them to live with Mixed Reality. All built into Microsoft Paint 3D. 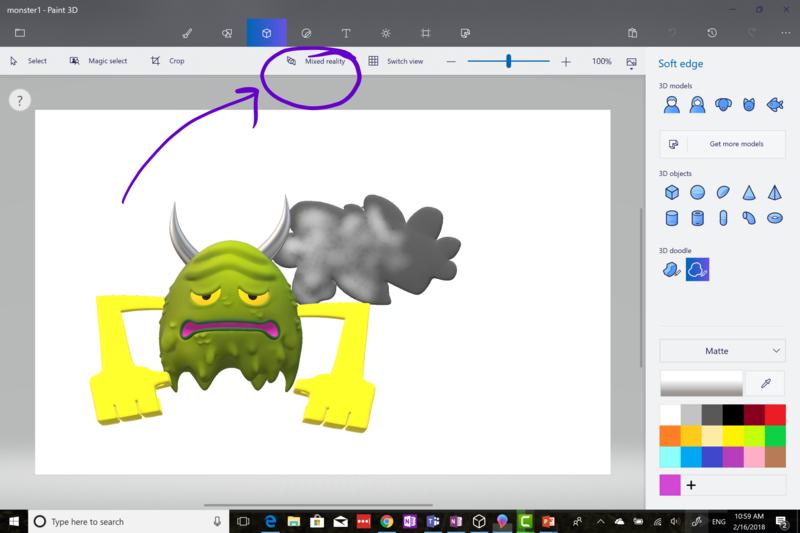 This is the second of three blog posts giving you some quick tips for how to get into using Microsoft Paint 3D in your class. 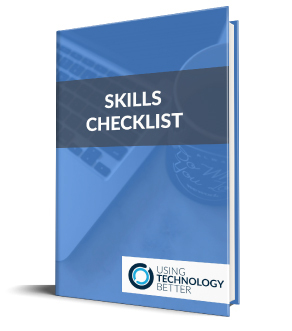 Your students will love imagining and creating with this great tool and it will definitely inspire and bring enthusiasm to your lessons. 1. Open Microsoft Paint 3D. If you don’t already have this on your Windows device you can get it in the Microsoft Store. You’ll need to be running Windows 10 or later. Choose to open a new project. 2. Select the 3D objects button from the menu. This will open a side menu, from here click on ‘Get more models’. 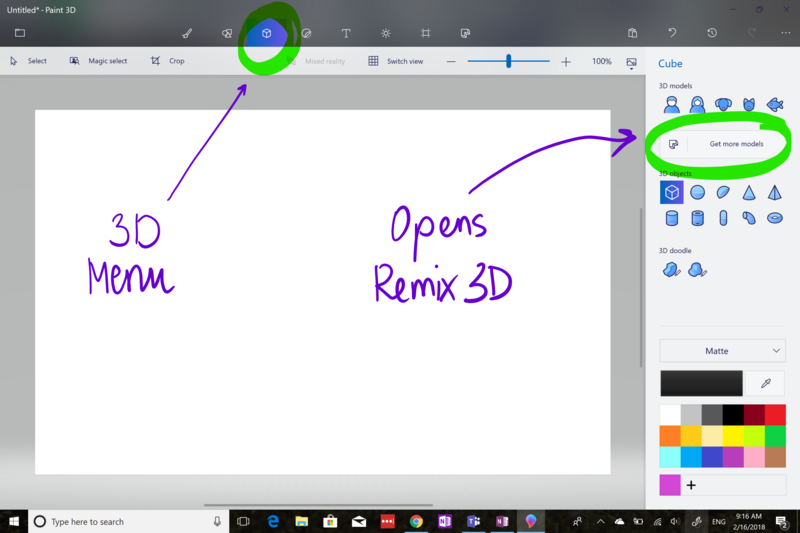 This will open Remix 3D from the web. You’ll need to be connected to the internet to do this. 3. Click on ‘Get Started’ in Paint 3D. 4. Scroll down until you find the model called ‘Make a creature’. Click on this and it will import it to your page. 5. You can close Remix 3D by clicking on any of the other buttons on the toolbar. 6. This short video tutorial will show you how to create your monster. You’ll also see how to turn your own doodles into 3D shapes and have two 3D objects sharing one space. It’s been sped up, so feel free to hit pause, or change speed settings, if it’s going too quick! 7. Click the ‘Mixed reality’ tool and wait for it to load. 8. Move your device around until you are happy with the view you see on the screen. 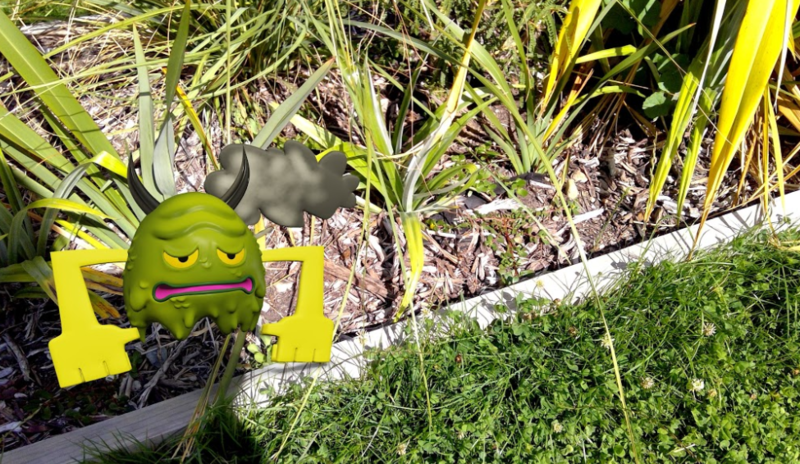 Then tap the screen to drop your monster wherever you would like it! If you don’t like the way it’s facing, click back on Paint 3D and rotate it around until you are happy. A circle button will appear on screen that lets you take screen captures of your monster in its new environment. 9. 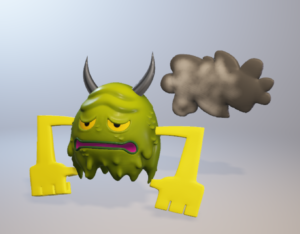 Select model view to move your monster around and see it from different perspectives. 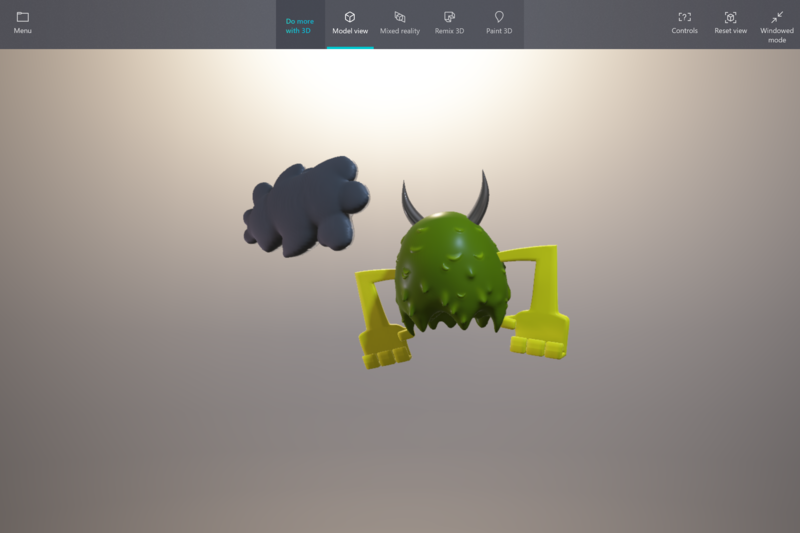 So that’s how you can create awesome 3D objects in Paint 3D and bring them into your world. This provides endless ideas and opportunities for creativity as well as teaching students about perspective, and developing their visual and spatial literacy. If you’ve read my other blog post about creating a digital postcard in Paint 3D you’ll probably already be thinking about all the great curriculum links that this sort of activity could inspire in your class. Make sure you check out all the other great models in Remix 3D. 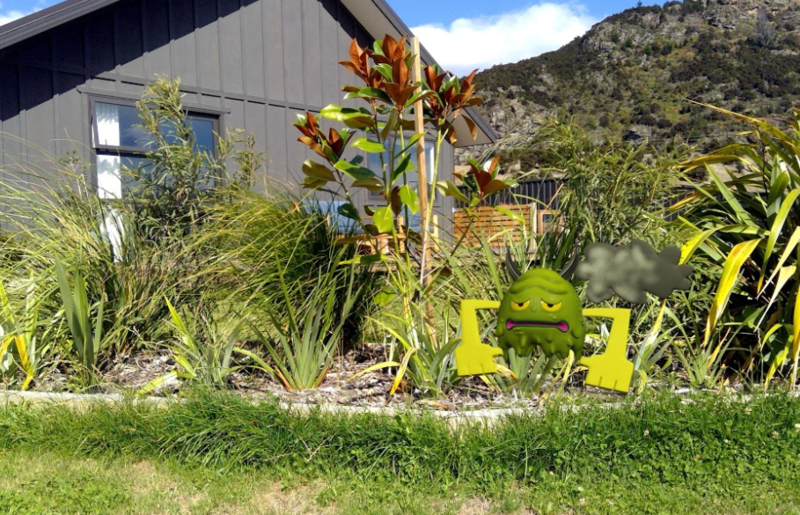 Now I just need to work out how I can get my monster to weed the garden and mow the lawns while he’s out there! Enjoyed using Paint 3D? Download the UTB app (iOS or Android) so you are kept up to date with blog posts. 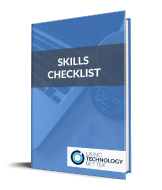 This is the second of three posts I’ll be writing about the cool features of this powerful tool. Or better yet – come along to one of our Microsoft STEAM days where we explore not only Paint 3D but also Minecraft and other Microsoft tools for education. Find an event near you here.